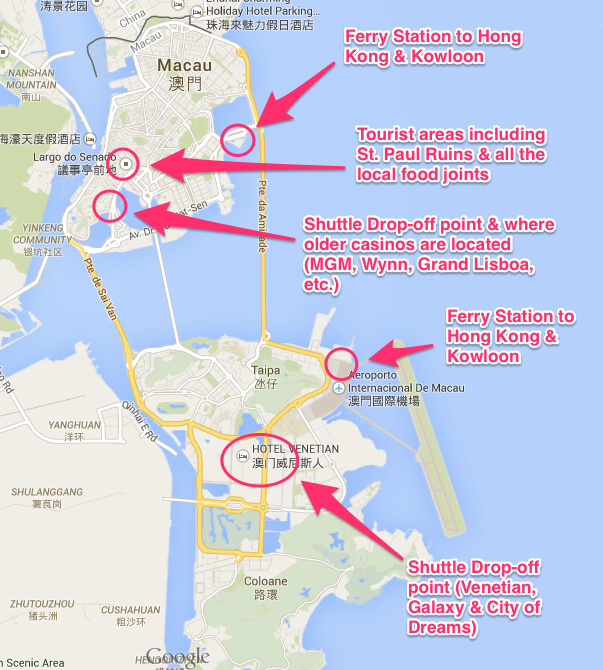 How to get around Macau (for free)? Macau now offers tons of free transportation options thanks to all the new casinos trying to win your business. If you’re visiting Macau for the first time, paying for cabs or trying to learn their local public transit system should be the last thing on your mind. Assuming you do not mind walking (which you will do as a tourist any way), you can leverage the free shuttle services offered by casinos located on the Macau Peninsula and the Cotai Strip. Macau is really small as it consist of the Macau Peninsula connected to two small islands: Taipa and Coloane. Thanks to the Venetian, those two islands are now connected and is called the Cotai Strip. Below is a map on what Macau used to look like before the Cotai Strip. If you’re staying on the Peninsula (where the Sands, MGM, Wynn, Grand Lisboa and other classic casinos are), you can literally walk to all the major tourist spots and taste all the local food offerings. If you want to visit the newer casinos on the Cotai Strip (Venetian, Galaxy, etc. ), simply hop on one of their free shuttles and they will take you straight to the casino. If you’re staying on the Cotai Strip, the Venetian and Galaxy offers free shuttles to the Macau Peninsula. Cotai Strip casinos also offer shuttle services to casinos on the Cotai Strip (for example you can take a shuttle from Galaxy to Venetian). Another stop to catch the shuttle is at the City of Dreams Mall located across the street from the Venetian and Sheraton. The City of Dreams is also connected to the Hard Rock and Crown casinos. Unlike shuttle services in the US, Macau casino shuttles are quite efficient. I have never waited for more than 15 minutes to get on a shuttle. The shuttles schedules are 9:00am to about 11:00pm. If you’re still partying outside after midnight or feel tired after walking, there are tons of taxis so you can help the TLC economy there.